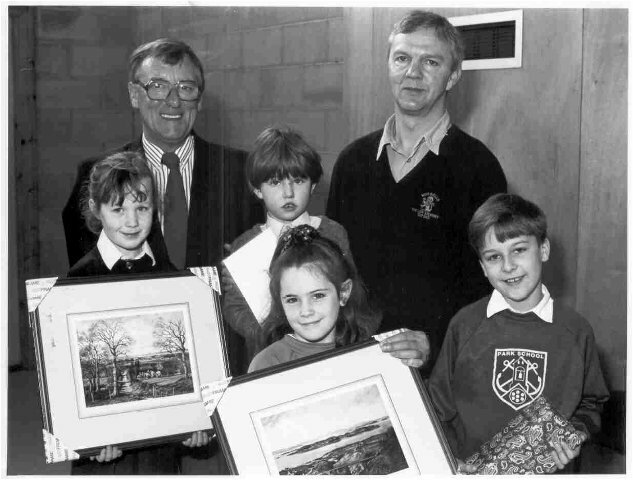 Janitor Simon Beaumont (right) left Park School in 1992 to move to Oxfordshire. Pupils, left to right, are Samantha Mitchell, Sammy Hewitt, Irene Coutts and Bryan Campbell. Ken Howie (Head Teacher) is looking on. Mr Howie was the best head teacher ever!! Is he still there or has he left? I agree. Mr Howie was the best Head Teacher ever. We used to love it when he came out into the playground. Kids would literally hang off his arms. He was always laughing. Still see him around when I'm in Muir of Ord. He's still fishing and gardening. Retired a few years ago now. Mr Beaumont was such a cool janitor. Remember the tricks he used to do? We all thought that his pulling his thumb off trick was amazing - we couldn't figure out how he did it. Those were the days! Mr Howie was the best teacher EVER!!! Does anyone remember Mr Beaumont used to bring his Duck to the school and it was called flymo?? Aw that school was awesome, happy days!! Yes - Flymo was a goose that was hatched at the school. Nice photo, Maggie ... I bump into Ken Howie from time to time at Ross County matches.... he always has time for a chat. I forgot about how we would all flock over to Mr Howie when he came out. He always had time for children; a legend of a man.